In this chapter of "100+ gk questions History National Movement mcqs " we deal with the top 100 best history questions related to our different exams like IBPS, RRB, RBI, SSC CGL. These are the most important gk Questions that were asked in the previous exams. So try to remember all these Questions. Let's Start our "100+ gk questions History National Movement mcqs "
3. Non-Cooperation Movement was passed in which session of Indian National Congress? 6.who among the following was not associated with Home Rule Movement? 7. The Revolt of 1857 affected Several towns in Bihar. Which of the following entries gives the correct sequence of the outbreak of the revolt in different towns of Bihar? 8. Be proud that you are an Indian, proudly claim I am an Indian, every Indian is my brother? who had said these words? 9. What was the ultimate goal of Gandhi's Salt Satyagraha? 11. Who introduced the railways and telegraphs in India? 13. Which of the following Movements was started by the Indian National Congress during the course of the Second World War and formed a part of our freedom struggle? 14. Who among the following was the leader of a number of anti-British revolts in Sambalpur? 17. Who was the Governor-General when the Great Mutiny of 1857 broke out? 20. Who among the following was a prominent officer of the Azad Hind Fauj? 22. Who among the following was associated with the Home Rule Movement from Madras in 1922? 27. Between which periods were the three Round Table Conferences held in London? (a) He was not a good administrator. (b) Local people rose against Clive. (c) Power was divorced from responsibility. (d) The home government did not encourage it. Answer: Power was divorced from responsibility. 30. Who among the following was responsible for the revival of Hinduism in the 19th century? 31. Who amongst the following Englishmen was fellow of Gandhiji in South Africa? 33. In which of the sessions, Home Rule Leaguers were able to demonstrate their political strength? 34. Who among the following was responsible for the revival of Hinduism in the 19th century? 36. On whose recommendations was the Constituent Assembly formed? 38. Who among the following was popularly known as Red Shirts? 41. Who was the first Indian to become the member of British Parliament? 42. Who conceived the idea of Pakistan? 43. Which one of the following is not correctly matched? 45. Satyagraha Ashram was established by who among the following? 46. Who was the founder of the Muslim League in India? 47. Who was the Governor General of India when the Indian National Congress was formed? 53. When did the British Parliament pass the Indian Independence Bill? (a) Economic reforms in U.P. 63. From where did Mahatma Gandhi start his historic Dandi March ? 67. Who among the following could not be captured by the British in 1857? 73. Which of the following was an empire Communist journal of M.N. Roy? 79. Who among the following was the leader of the moderates? 80. Who among the following started Bhudan Movement? 82. What was the chief characteristic of Government of India Act, 1935? 83. Which of the following statements is not correct? (a) Swami Dayanand Saraswati established the Arya Samaj. (b) Mahatma Gandhi was born in Gandhinagar. (d) The international headquarter of the Theosophical Society is in Madras. Answer: Mahatma Gandhi was born in Gandhinagar. 84. What was the name of the periodical published by Mahatma Gandhi during his stay in South Africa? 85. Which of the following was written by Raja Rammohan Roy? 86. Who among the following first propounded the idea of basic education? 87. What did Gandhiji do to practice the ideals of truth and non-violence in 1916? (a) He started an all-India Satyagraha. (c) He founded the Gujarat Vidyapeeth. (d) He joined the Indian National Congress. 90. Which of the following statements regarding Quit India Movement is correct ? (a) The movement paved the way for British seriously considering granting freedom to India. (b) The Muslims did not participate in the movement. (c) It was entirely a non-violent movement. (d) The upper middle class did not show interest in this movement. Answer: The Muslims did not participate in the movement. (c) Transformation of the peasant cultivators into tenants at will. (d) Agitating against the British monopoly in administration. 95. Before Delhi, where was the capital of India during British India? 97. Which of the following is not a form of Gandhian Satyagraha? 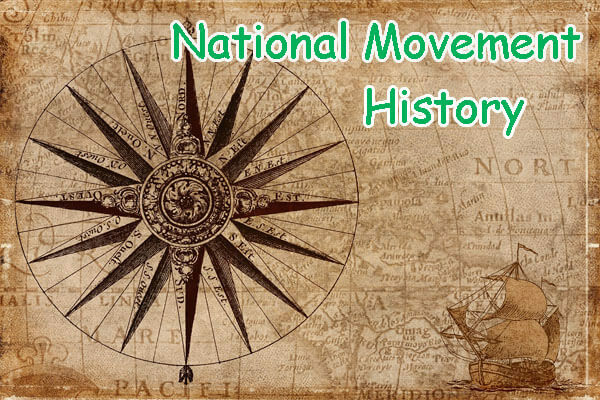 I hope you all like our "100+ gk questions History National Movement mcqs " if you have any problem related to gk question then please comment below. We try our best to solve all those. NOTE: Dear students if you found any mistake in our Questions then inform us by commenting.